There has been a stereotype surrounding athletes in general and football players specifically. Malicious prejudice that is based on a misguided analysis of reality. The prevailing stereotype is that football players 'don't have much between their ears', or in other words, that they're not very smart. It's easy to say, since sport is the crux of their existence, and sports in general and football specifically aren't exactly on the level of medical school. Football players spend their days playing football, talking about football, living football. They need to be good looking, talented, and good players - they don't have to talk much. But when you get to know more and more athletes, and when you hear more of what they have to say, you start to understand the depth of their thoughts and the wisdom that's in them. Not wisdom that you get by studying in a classroom, rather, wisdom from the long road they had to walk on the path to greatness. One such athlete is ​Troy Deeney, Watford's star striker. He grew up in poverty in a bad neighbourhood, with a father who left him at a young age, he got in a lot of trouble and even went to prison. 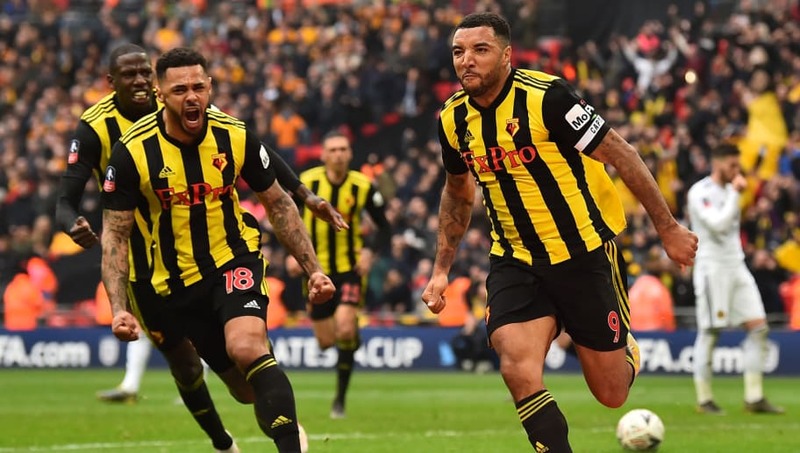 Among the countless moments of this crazy Premier League season, one of the highlights so far this season occurred in extra time of the FA Cup semi-final between Watford and ​Wolves on Sunday. Wolves were leading 2-0, Watford halved the deficit and in the 92nd minute, Deeney was brought down in the box. He was the one to take the spot kick and with enormous strength - from the leg and the heart - he almost tore the net off to make it 2-2. It's hard to remember the last time a player ran with such speed, such madness and uncontrollable elation after a penalty. Even Usain Bolt wouldn't have been able to catch him. The comeback was completed in added time. The Hornets won 3-2 and will meet Manchester City in the FA Cup final. The man who as an 18-year-old had to pay £10 a week just to play football at an amateur club, is about to be at the head of the line of ​Watford players, as captain, at Wembley, only 90 minutes away from winning a historic trophy for the club. And then came the post-match press interview. Two and a half minutes of personal charm and human insight. No cliche's. Two and a half minutes with a man who has learned from experience about the meaning of life, a man who isn't posing for the cameras. He was asked by the interviewer what his message was for all the people who were thinking about leaving this game, to give up, and ​he replied (courtesy of beIN Sports): "You know, it's not just about this game, I want to go deeper - it's just life in general. "There's always going to be setbacks. Don't believe in Instagram when people tell you that's real life, everything's easy. Everyone's got bills, everyone's got heartache, everyone's got problems. "If you can continue the course, if you can stay true to yourself, everything will be alright, and that's kind of what I do. I still make mistakes daily, and I still try to be a better person, but personally this moment is everything to me. I've got everyone who believed in me and everyone that trusted me here today, and I'm just happy." Check out the full interview. Watch it when you're feeling a bit down, listen to it when the path isn't easy. Watch it even if you aren't footballers, just people who are having a bad day.